Now that "Array List Get" is not in the action browser or ecobrowser, how do I import my text file into an array? If I cant, what other solutions (not hand typing data) are people using for large data import and access (Weapon Stats, Items, etc etc.)? You can get the package on the Ecosystem. But this is using the array list proxy. Are you following some tutorial? Thanks for replying. I recall using a text file and uploading with that action, maybe thats old news now. I have looked at Array Get and it doesnt have a file location field to upload. Perhaps you could give me a short example of how to upload a text file into an array? I havent solved this, is there a way to load a text or csv to an array please? 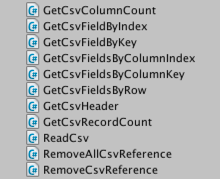 Currently, you can get a csv file into an Xml and use DataMaker to put your data this way. I am currently working on a project that make use of Google sheet and I am making new actions to work with csv file, so soon you'll be able to pull data from csv to ArrayMaker. Let me know if this is not suitable for you, but you can indeed save rows and columns into arrays.